Ingredients: a hypertonic solution of deionized water, sodium chloride (2.65%), potassium phosphate/sodium hydroxide buffer (to prevent nasal irritation), dissodium EDTA, and benzalkonium chloride. 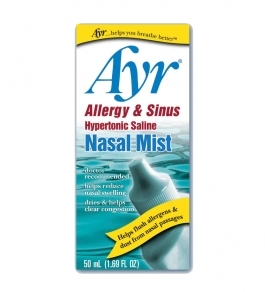 Helps dry nasal congestion; helps reduce nasal swelling. Useful as a wash to flush allergens and dust from nasal passages. Cap band with imprint: Sealed For Your Protection. Use only if intact. Hold upright and squeeze twice in each nostril. Use 2-3 times daily as needed, or as recommended by your doctor. Take care not to aspirate nasal contents back into bottle. If spray tip touches nose, rinse with hot water before replacing cap. May cause a mild, temporary stinging sensation. Use only as directed. Keep out of reach of children.